Whilst scrolling through my Facebook feed about an hour ago, I came across Louise - Sprinkle Of Glitter's last Facebook status. She wrote about her 'mini happies' from her day and I remember her doing this a few weeks ago too. I really enjoy reading these statuses of hers, because they make me happy to see someone else so happy, enjoying life AND appreciating it. It makes me think about mine and the little things that make me happy generally whether it be that day, because of the time of year, things that happen all the time, or things that just are. I want to share my current little happys with you, because I think it's important to share the good vibes just like Louise does. Sprinkling happiness wherever she can! 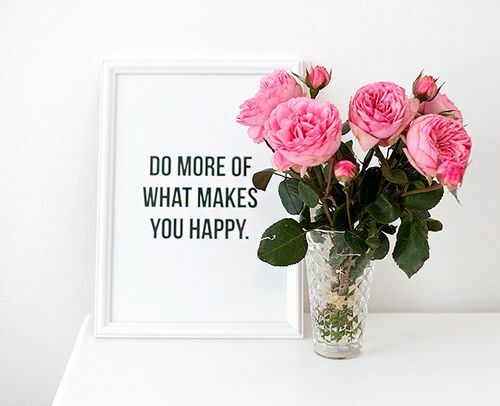 I think this will be good for me on a down day too because then I can come back to this post and read about the things that make me happy and inspire me to find something happy in that crappy day. Spring is here. All the flowers are really starting to bloom now and it makes me happy that warmer days are yet to come. Those are my favourite. Writing really neatly without any mistakes. I'm told I've got quite pretty "teacher" handwriting, so when I write something all pretty without any mistakes it satisfies me. #HandwritingGoals. Doing a really good job. I love the visual merchandising side of my job lots, so when I make something really visually inspiring I feel so accomplished. Today I did that and I was made for my days work. A new CD in my car. I just bought the Ariana Grande, My Everything album and I can enjoy drives to and from work again. Such a good album too. Sitting outside for my lunch hour and enjoying the sunshine. I did this today for the first time this year and I finally felt like it was spring! Watching Better Call Saul on Netflix with the boyfriend. Having a new series to watch on Netflix with him is my favourite. We're both really good and wait to be together before watching a new episode. We did it with Top Gear too before it ended. Good Morning & Good Night Texts. Cuddling my Dolly. I miss my little pooch so much right now that we're temporarily living apart, but I'm so excited to be taking her out for the day tomorrow so we can spend some quality time together. Family Time. I have learned to appreciate this so much more with everyone staying in different places during the double extension build. Any family time is precious, and I realise how much I love them and their little habits (though annoying in lengthy periods) when we're all apart for such a long time. Taking my make up off at night. This is one of the most satisfying tasks of the evening (apart from taking off your bra), there's something about going to bed with a fresh face clean of anything and everything. Bliss. Lying in on my days off. Taking a really good photo for my blog or Instagram. I feel like I've lost my photography skills from 6th form and uni, but I'm keen to get them back. Taking a good photo really makes me happy these days. Cute puppy videos on Facebook. This is basically all I use Facebook for at the moment. Anything cute and puppy related brings a smile to my face and there's always some cutie ready to make me 'aww' at them. Today I watched a dog teach it's foster puppy to walk down the stairs. Adorable. There are a couple more I'm sure but this is all I could think of for now. Why don't you share with me in the comments what makes you happy right now?